Most of us use Facebook Chat every now and then. Chat facility is integrated with Facebook Mobile app and is accessible from multiple platforms. The messaging got much better today with the release of new Facebook Mobile Messenger, a standalone app which is available for download on iTunes store and Android market place. The original Facebook Mobile chat doesn’t support locations, exchanging photos and group chatting. 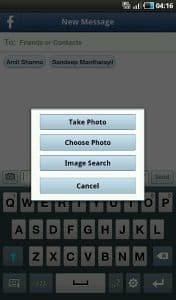 Those who have used Whatsapp messenger for iPhone/Android/Symbian might be aware of the convenience it provides in sending and receiving instant messages on mobile phones. I have been using this app for a while, but I don’t have many friends on it. Now that Facebook released a new Mobile Messenger, I can communicate easily with a wide network of friends-and the ability to transfer pictures and stamp location data seems to be very promising. Another thing is the group chat. Recently released Google Plus Mobile app has a group chatting feature called the Huddle. Group chatting in Facebook Mobile Messenger works in a similar way. You will get an option to select multiple Facebook chat contacts when you open “Compose” option from the top right corner. The FB Mobile Messenger app is expected to get video/audio sharing features in upcoming updates. Download Facebook Mobile Messenger 1.0 Android here. Apple iPod/iPod Touch/iPad here. The app is presently listed in USA app store. If you want to make the Android version work in India or outside US, download the Facebook Mobile Messenger .apk file and install it from your storage card. Apple iOS users should get a US account, change store from phone interface and go to the link given above. Later, you can switch back to your old iTunes account-but remember not to sync the device with iTunes until Facebook releases the Messenger globally. Its a good application. But you have to make it available in other platforms too. Hey, thanks for the info. What will happen if someone sends a message from Facebook Mobile Messenger to a non-compatible device running Facebook Mobile app?